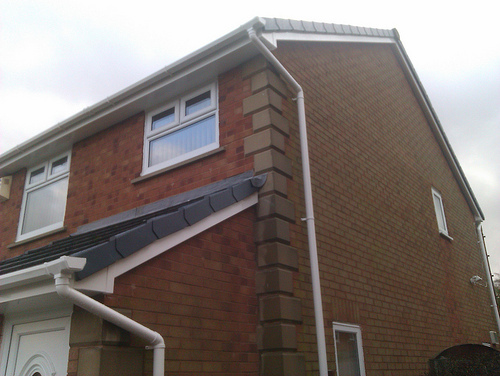 We offer the complete service for Fascia replacements and new Gutters. With cosmetics being most customers reason to upgrade and change their Roofline, there are a few more important ones that we talk of below. With most customers in replacing their fascia, soffits, gutters and downpipes for cosmetic purposes only, there are some more important reasons to have the work done.The most common reason usually goes unoticed as the roof spa's ( also known as eaves) get saturated with water over time due to either a hole in felt , a damaged tile or poor fascias that have soaked up so much rainwater it has made its way through to the spa's. The eaves are cross cut at the ends that meet the fascias and once in contact with water , it will manifest itself over a period of time and gradually move up the roof spa using the grain in the timber the same way as sucking water up a straw. What Job Does My Roofline Do? (2) Sodden ground due to poor quality gutters or missing gutters can start to cause damp issues within the lower parts of the building and in extereme cases can effect the foundations of the property if not addressed for a long time. ​(3) - Perished felt at the edge of the front tiles can mean water getting behined the gutters and into the the boxed section of the fascias and soffits. It is possible for this water to eventually get into the wall cavities and start to cause internal water damage. We only ever replace your fascias, as to cover over old timber which has been subjected to the weather is detrimental to your roof. It will cause damp issues in the long run and is only a tempoary fix for cosmetic reasons. They dont do the job they are meant to do as mentioned above. Once the existing timber fascias are removed the revealed roof timbers are sprayed with A clear preserver to prolong the quality of the eaves. Access to this part of the roof wont be for a long time. All acccessable roof space is cleaned off and prepared for the new upvc fascia boards. The first row of tiles will have a new membrane undercovering any perished felt that may have worn over the years. Allowing an overhang of around 3 inches, which will eventualy fold into the gutter system to prevent any water getting behined the new fascia boards. All our new fascia boards are fixed with galvanized fixings to prevent any rust markings and have matching platic tops. All new rainwater guttering systems will have an efficeint fall on them to prevent ant silt, soil and seeds collecting and causing any back up. All downpipes will be directed to designated drains. Not just to a convenient surface , even if it was the case beforethe new installation. 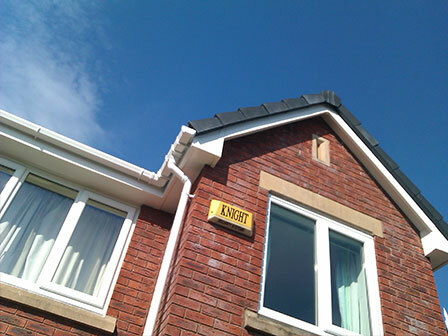 All of our fascias, soffits, gutters and downpipes come with a 10+ year product guarantee.All of the gutters especially the darker colours are white on the internal side to combat the effect the sun has on them during warm days. 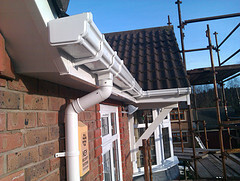 A length of ordinary gutter can expand up to an inch and contract throughout the cold night time. Over long periods of time the guttering can eventually move out of their sealed joints and unions, start to leak - and start to cause water damage below. 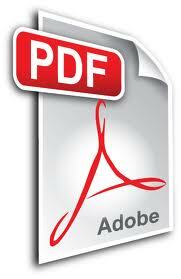 ​We aslo always seal ever single joint and connection as an added prevention to this problem. Although the new fascias are upvc they are not completely maintenance free - with the obvious one being cleaning. The other being blockages and objects in the gutter system causing backup. If the customer chooses the black, woodgrained or one of the new colours available they will probably not need cleaning for a few years at a time. We suggest getting white cleaned every year at most to prevent any ingrained dirt and permanent water marks. 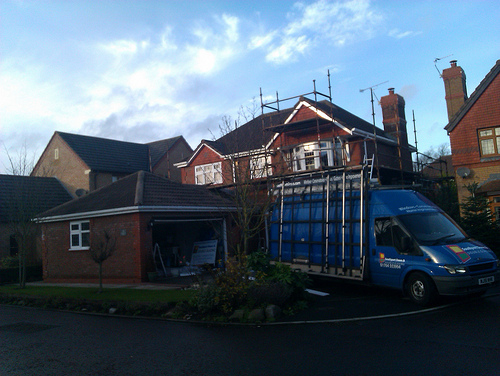 Unless your property is a bungalow it will need scaffolding out. To do work of this nature at height would not only be a health and safety risk but also be detrimental to overall quality of the job. it is far easier to get the quality expected from working at chest height. This also allows us to get the customer if they wish to see any problems or rot in the roof for themselves. 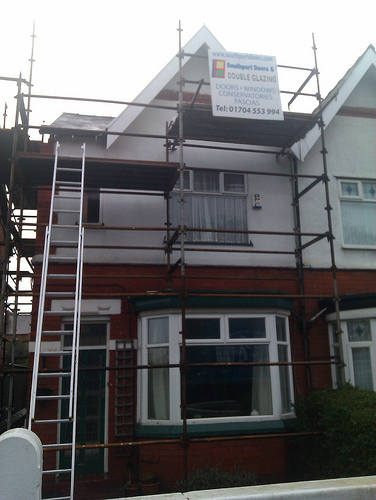 The scaffolding will be a seperate price given and will be paid direct to the scaffolder on removal. we allow our customers to use our 60% + trade discount on scaffolding, as it usually necessary to use on our jobs and will not be done without. We're confident we can offer the best prices around. 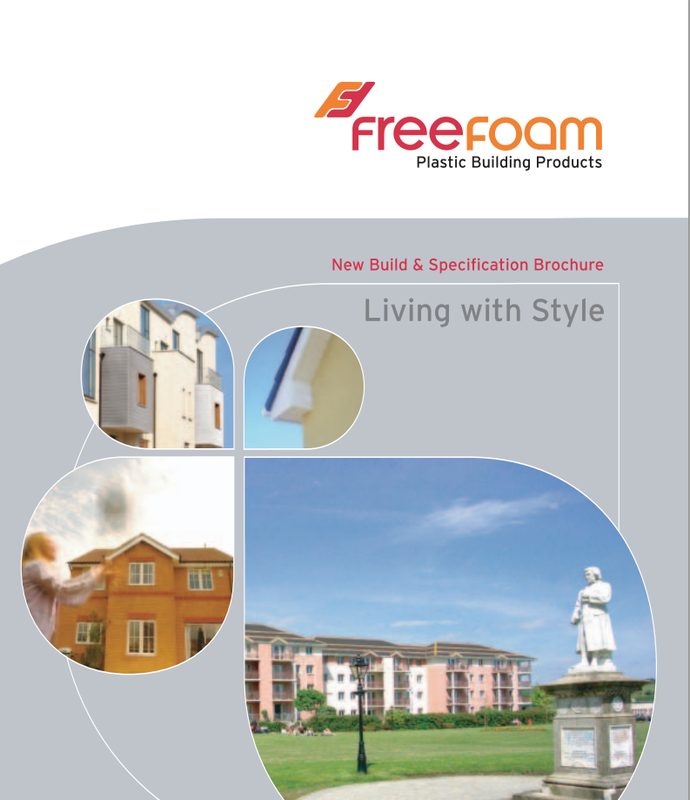 Call for your free no obligation quote. Once deciding that you would like to go ahead with the replacement of your old existing fascias there is the option of upgrading the guttering system. ​As shown in the image , the ogee gutters have a distinct shaping which would normally match up to housing which previously had cast gutters. This type of gutter also holds the maximum amount of rainwater compared to other styles. The minimum being the half round- then the sqaure and then ogee.​The ogee is ideal for roofs that many valleys or areas that need to accept a lot of rainwater in heavy downpours. The option of using coloured fascias has been around for a while, and is beneficial to customers who want as lower maintenance as possible. Although regular gutter clean outs will still be necessary to prevent a backup.The actual fascia board itself will not need to be touch hardly if at all. The coloured boards don't have as much of a dramatic finish to the job as white does . The white boards stand out alot more as they are bright white and give a brand new look to the property.